The history of Catus fatus starts in the most ancient times. They accompanied humanity as long as there were mice in granaries and sweet cream to steal. They were often seen in company of kings, emperors, and even Gods. Ancient Egoptian papyrus showing a time when Fat Cats weren't totally unhelpfull yet. 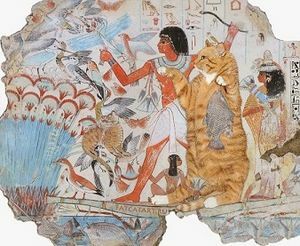 In Early Egoptian times, when the cats weren't known as "fat," yet, the people of Great River started to worship them and shower them with adoration, luxuries, and tasty treats. 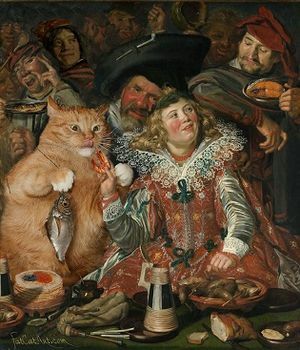 From snack to snack, and Fat Cats came to be as we now know them. This fearsome weight is not a coincidence. In Ancient Grease, they were often invited to wild orgies, where they served as puffy pillows for unconscious drunkards. 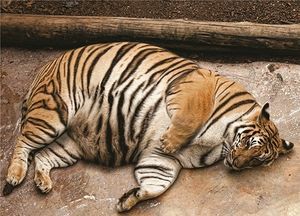 There is a rumour that the most favoured tiger skin cushion of Dionysus  was in fact a very much alive, but lazy, Fat Cat. Fat Cat in company of his faithful minion, Napoleon Bonaparte. 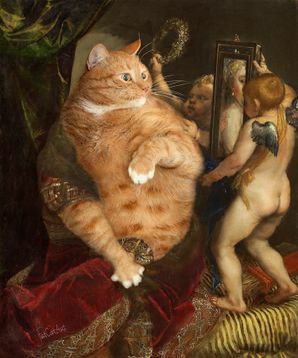 In later ages, after the fall of the empires, Fat Cats tried to find suitable company to grace with their presence and were unsuprisingly glad for hedonism, decadency, and dandyism. It is a massive, gargantuan, purring machine of smashing destruction. It doesn't know its own strength. Or weight. Fat Cat has a habit of sitting on heroic laps to be patted and accidentally crushing the captive to death. Comes in all colors, but one shape: round. A good tactic to defeat this monster is to lure it near steep slope and give it a little nudge. Their luxuriously soft fur can distract even the most hardened hero. That last piece of pizza pie. ↑ Frans Hals, "Merrymakers at Shrovetide." ↑ Well-known to any hero as god of uncontrolled partying. 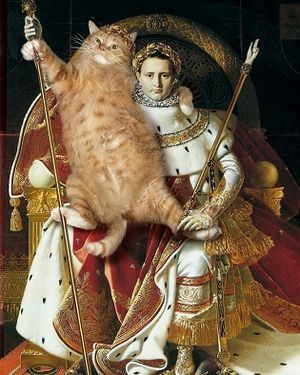 ↑ Jean Auguste Dominique Ingres, "Napoleon I as the Imperial Throne for the Cat." This page was last edited on 14 April 2019, at 22:40.